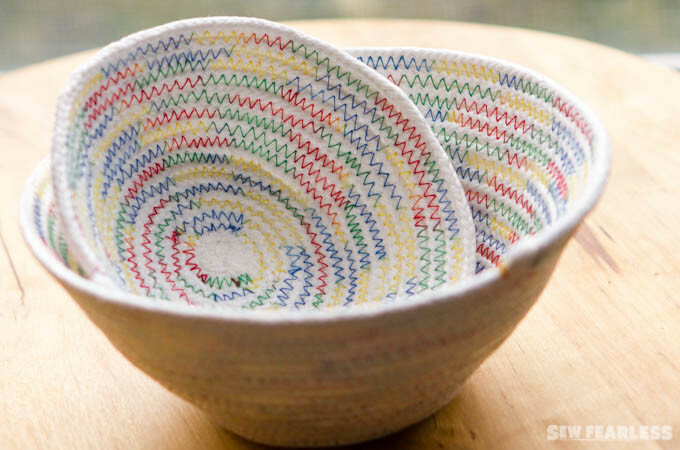 The rest of the world can keep their adult coloring books, I have found a different therapeutic creative outlet – rope bowls. After seeing these pop up a number of times, I had to figure out how they were made. I looked up directions for how to make rope bowls, and came across Flossie Tea Cakes tutorial and this paint splattered one. 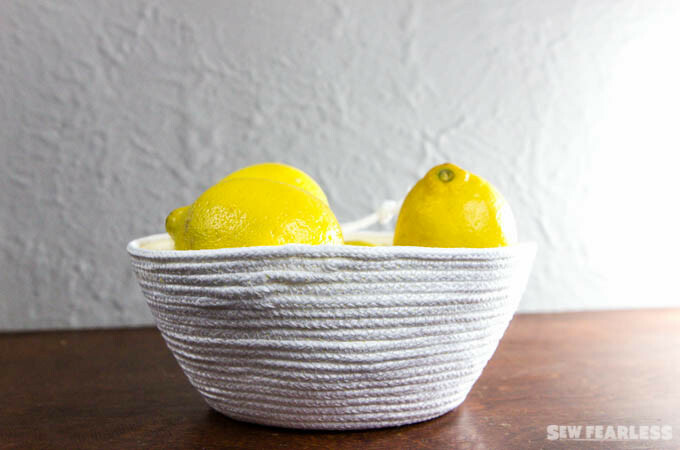 The bowl is constructed from clothesline. Although all the directions I’ve seen call for cotton-covered line, I couldn’t find any at my local hardware store. I used 3/16″ synthetic rope instead, and it worked out just fine. The project doesn’t have strict steps or rules. Basically you start with a coil of rope (the trickiest step), and then zig-zag row after row of rope onto the coil. I used a walking foot, but I’m not sure if that is crucial to the outcome or not. I left my bobbin thread white and experimented with various colors of threads in the top. The process is simple which makes it soothing and meditative, and it lends itself to experimentation. 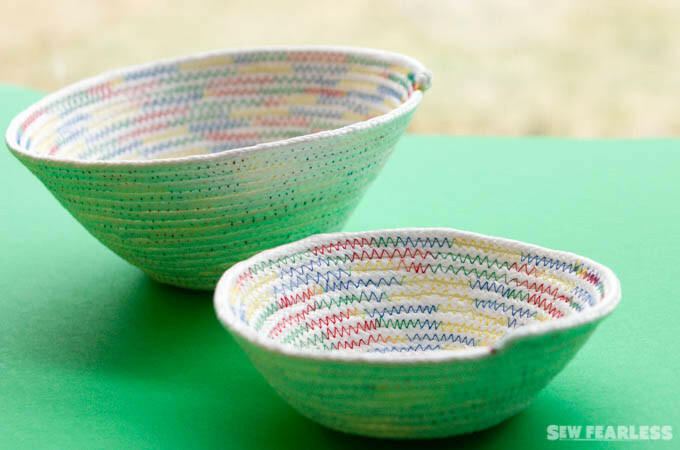 However, the thing that is so thrilling about this process is that, unlike any other sewing project, I find the imperfections in these rope bowls charming. Which is why I plowed through 150 feet of clothesline in less than 24 hours and can’t wait to get back to the store to buy some more. 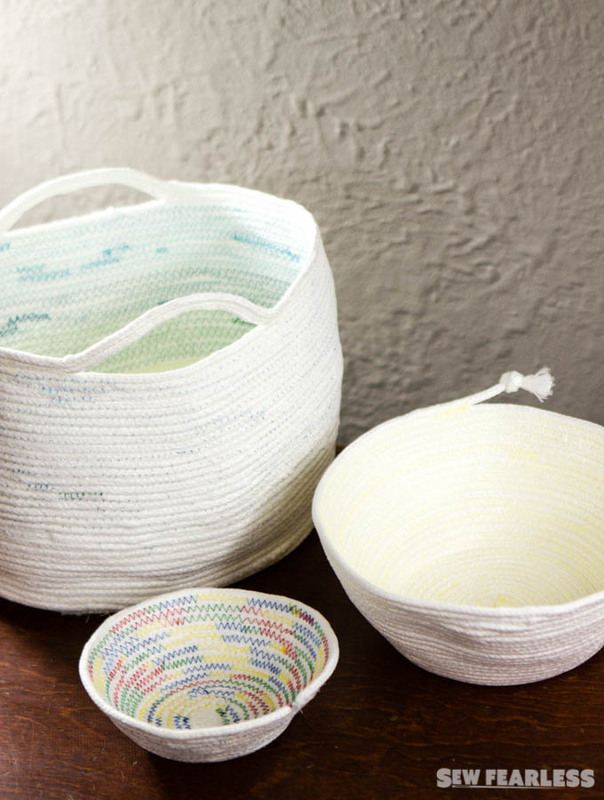 Do you have a type of sewing project that you find particularly soothing? I found you via a link from Abby Glassenberg. 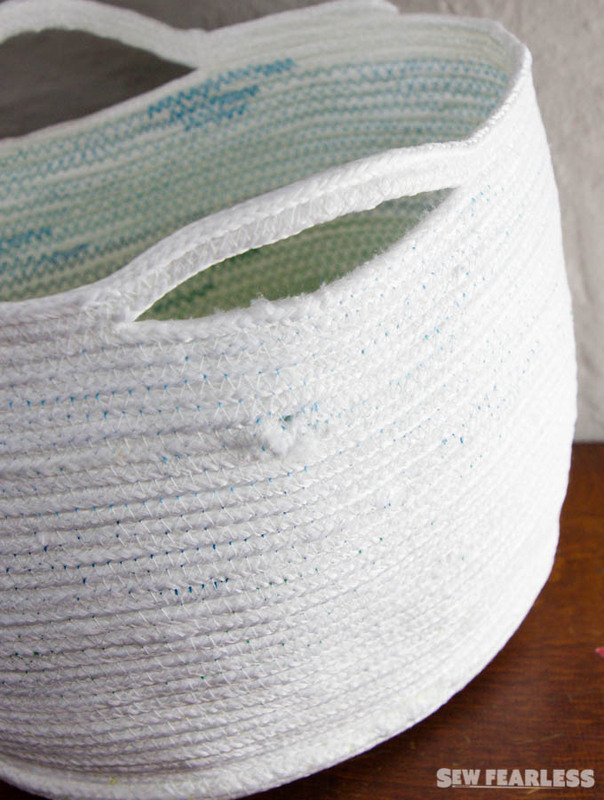 You are SO right about these bowls, the making of them is so very meditative, even healing. I made several of them too, and did a little experimenting with some natural dyes, though I don’t know how synthetic would take natural dyes – I’m still learning. That is so fun, Tanya! We really do have something similar feelings about ropw bowls. I love what you are creating, especially the utensil holder one. I’m itching to add another project . At this rate I will never get this studio/sewing room/computer room cleaned up. 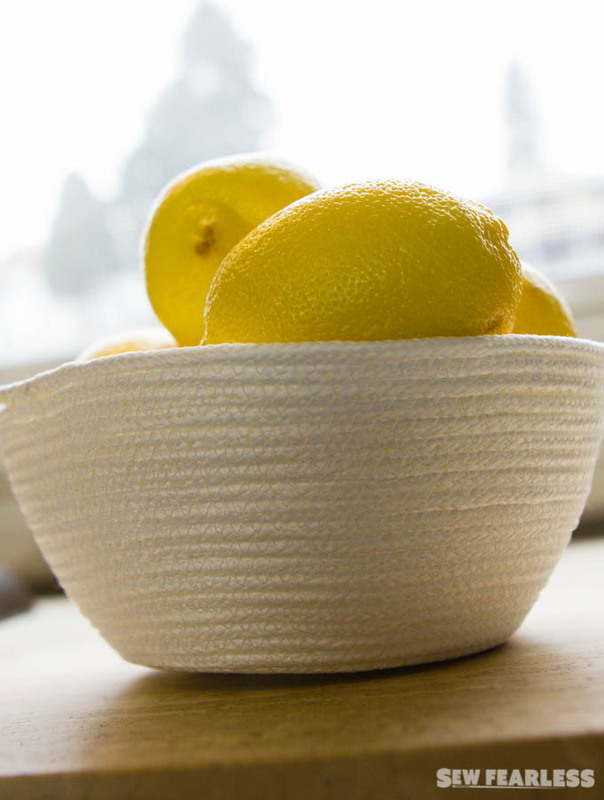 Love your lovely bowls, great color ideas and the handles! Thanks so much for the inspiration. Oops Jodi, posted with the wrong name…sorry, guess this is what happens when you keep following a blogging subject . 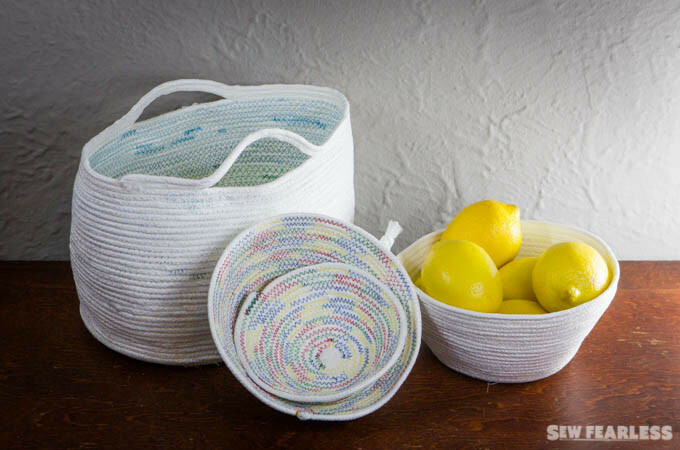 I use up fabric scraps making rope bowls. Just cut strips of fabric about an inch and a half to two inches wide ( and any length) and wrap diagonally around the rope. Use a dab of basting glue at then beginning of each fabric strip. 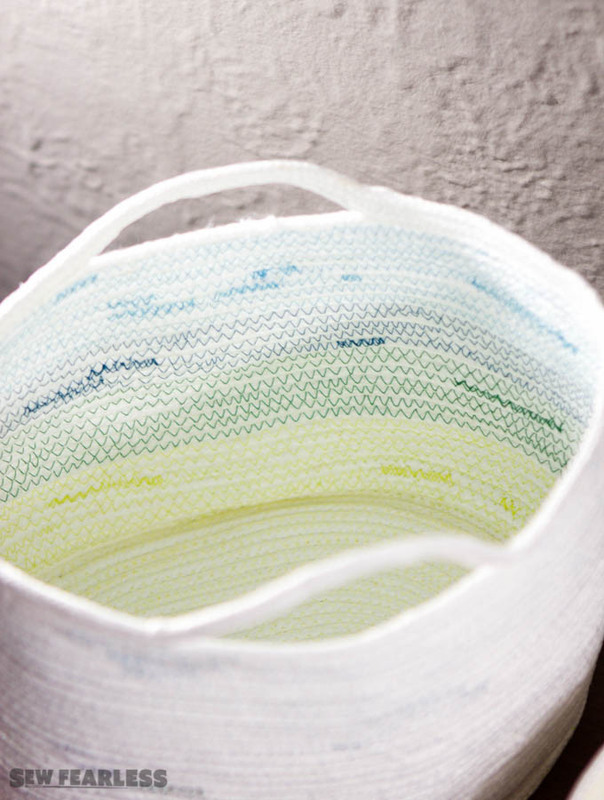 You can use all the same fabric or mix and match – they all turn out beautifully! I love these! I will have to try some as soon as I have my sewing space set up in our new cabin.